Like slugs and granny – greys or woodlice, earwigs are creatures that make me shudder a bit. Even researching for this gave me the creeps! They are pretty scary looking but apparently the urban legend that they are so-called because they burrow into people’s ears, lay eggs and chew through to their brains, causing insanity and excruciating pain is NOT true. Their pincers are in fact, relatively harmless to humans although I did discover some fairly graphic descriptions of possible earwig ‘bites’ here which hasn’t made me feel more comfortable about them at all! 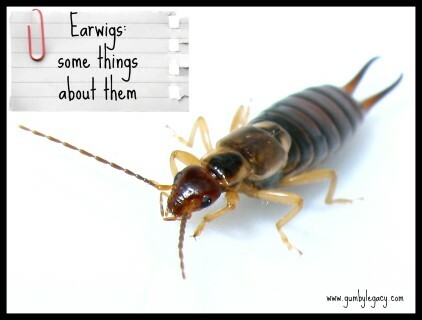 I also found out that mother earwigs look after their babies until they can fend for themselves so they can’t be all bad! Earwigs tend to like living in moist, damp places like mulch, flower beds, rotting wood, under stones etc and they are attracted to light. For this reason, it’s best to make sure that there is a damp free zone of around 6 inches around your house with no flower beds or pretty rock formations as this is where earwigs and other insects may like to congregate. Also, shine a light away from the house, not on to it. If there are any cracks or crevices to allow entry into the house then the creatures may indeed, find their way into your home. Like other insects, this can lead to problems and is generally rather unpleasant so here are some handy, natural and other, ways to deter or get rid of these freaky looking creatures. Even though the likelihood of one finding its way into my ear is very unlikely, I’d rather not take the chance! Please do share if you have had experience of an earwig or any other bug crawling into your ear! Or if you have had an infestation in your house, how did you get rid of them?